Too Much Clutter? 12 Ways to Better Organize Your Life! It's the beginning of a new year, and many of us are starting things off right by setting new goals for home and health and happiness. For some of us, all three of those things can be improved with a little decluttering around the house. 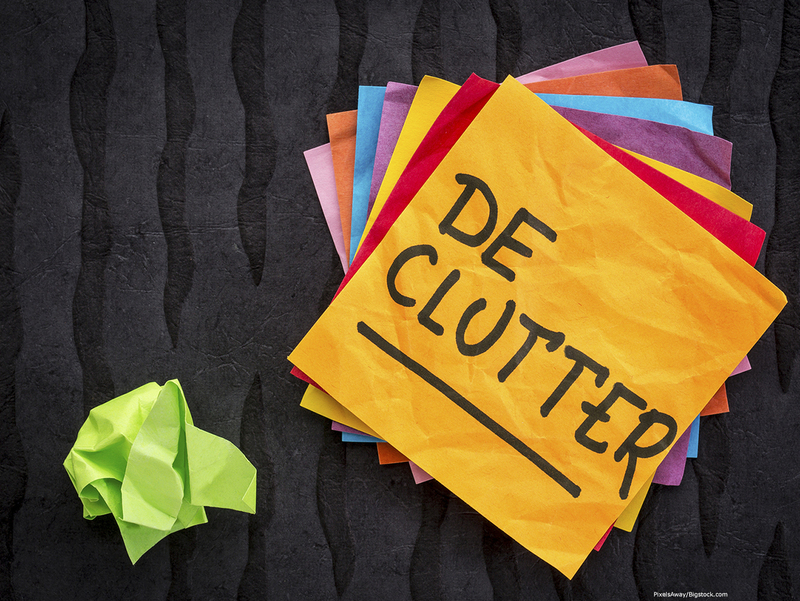 If you've watched Marie Kondo's show Tidying Up on Netflix, you know that decluttering can not only improve your enjoyment of your space, but also improve your health and your whole life. Still, though, not all of us are ready to throw out all the things that don't immediately "bring us joy." There's paperwork that we need to keep around year after year, no matter how boring it is, sporting equipment that we only use for part of the season, holiday decorations, stuff the kids left at home when they went off to college, you name it. Fortunately, you can declutter and open up your living space without throwing things away with a little help from self storage in Joplin. (1.) The first thing to do is to take an inventory of what you've actually got: all the books, all the clothing items, all the coffee mugs. Make a list, organizing items by type, so that you have an accurate representation of what you're working with. From there, you can start making decisions about what you want to keep, what you no longer need, and what can go into self storage! (2.) Put everything where it goes. If you have books, put them on a bookcase. Most home organizers agree that having a place for everything—and keeping everything in its place—is a great way to start! If you run out of space for something, don't worry. We'll get to that in a minute! (3.) Involve everyone in the family! This serves two purposes. First, it makes your workload much lighter. A second (or third or fourth) pair of hands is always helpful. Second, nobody likes it when somebody else boxes up their belongings. Making de-cluttering a family project keeps everyone happy! (4.) Don't dump excess belongings on your extended family members. Chances are they all have plenty of stuff and not enough space, too. If you've got stuff you want to keep but you don't have room for it, that's a job for self storage in Joplin. 5.) At the same time, immediate family members still need to take ownership of their stuff, especially if they've already left the nest. (6.) Storage containers are a great ally in the fight against clutter! Just make sure that the storage containers you buy are up to the task. Look for containers that are large, sturdy, and moisture-proof, with lids that seal tightly. Clear plastic containers can help you see what's inside, too. (7.) If you've got stuff packed away for long-term storage (say in those nice clear containers we mentioned), get it out of the house. The idea isn't to move clutter from one room to another, but to get it out of your living space so that you have more room to, well, live! (8.) That's where a convenient self storage space comes in handy, to give you a safe, secure, accessible place for everything that you don't want in the house. (9.) When you're decluttering, it's okay to let go of "gift items" that you've acquired over the years. That vintage turkey serving platter that your mother-in-law got you as a wedding present can go into storage—or go away entirely—and no one will ever be the wiser. The same goes for all the free swag bags, promotional items, and samples of things you've accumulated over the decades. (10.) Remember that the goal of decluttering is to identify the things you really want to keep, rather than to find things to get rid of. This is where self storage can help you safely store things that you're not ready to part with but have no day-to-day use for around the house. (11.) There's nothing to be gained from throwing away things that you really want to keep, no matter how much space they take up. If you need some extra room, self storage in Joplin gives you a place to pack away all your treasures until you need them again. (12.) One last tip: Before you get too far into your decluttering process, make sure that your retrieval process is as easy as possible. Digital organizer apps for your smartphone can help, and the best of them let you track what goes into each box and even print labels so that you can find the box with that Breaking Bad complete series on DVD when it's time for a binge. If you'd like to declutter and simplify your life in the new year, Countryside's self storage in Joplin, Pittsburg, and Frontenac can help! Contact us today to get started!